Some bloggers on the Christian Bible speculate about the differences between the four canonical gospels. Recently, for example, Victoria Gaile Laidler, J. R. Daniel Kirk, and Brian LePort have so posted. Other bloggers specifically attribute the unique characteristics of the gospels to “rhetoric.” For instance, Scot McKnight wrote a post last year entitled, “Gospel and Rhetoric.” Mike Duncan, (who’s also a professional rhetorician) of the blog “Bad Rhetoric,” has asked a question about the introduction to the gospel of Mark and answered it, in part, with “rhetoric.” And Joel Watts, in the midst of a rhetoric study of Mark’s gospel for a graduate degree, blogs frequently on the New Testament, especially through the lens of rhetorical criticism as articulated by George A. Kennedy, one of the leading scholars on ancient rhetoric in the world today. That all seems awfully technical. And yet I want to post now about something similar but a topic even more technical. This little blog essay is intended to “show and tell” just a bit of the rhetoric that the gospel-writing Luke learned. His rhetoric comes not only from the old Roman art and even older Greek art of rhetoric in general but more specifically from the treatise On Rhetoric written by Aristotle. See that? Fine. Now let me “tell” a bit. When I called the highlighted Greek words of Aristotle and of Luke “common,” what I meant was these words are “in common” to the respective writers. In particular, they are in common to the respective and specific openers to the respective texts of the respective writers. 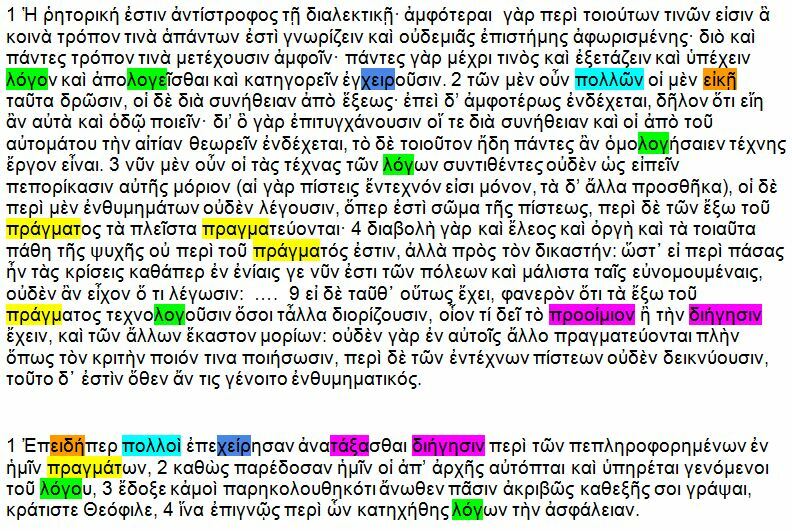 Maybe I should have called these words “technical.” In fact, the word διήγησις (diēgēsis) in Luke’s gospel Chapter 1 and Verse 1 only appears there and nowhere else in the whole entire New Testament. And among the Greek philosophers, only Plato uses it (for Socrates speaking in the Phaedrus once and in the Republic eight times) much; and then Aristotle (just twice in the Poetics though ten times in the Rhetoric) as an important term in good rhetoric. Aristotle is the one who gives definition to the word. Kennedy usually translates it “narration.” I need to tell you more, don’t you think? The first chapter of Book 1 was written for students in Aristotle’s philosophical school who had completed a study of dialectic and who perhaps had little practical knowledge of rhetoric, though they may have been aware of the existence of handbooks on the subject and probably also of Plato’s strictures on rhetoric in the dialogues Gorgias and Phaedrus. Thus they would be interested to hear what Aristotle had to say in reaction to those works. The chapter as a whole is very Platonic and contains echoes of several of Plato’s dialogues…, but neither here nor elsewhere in this work does Aristotle criticize Plato by name…. After discussing the similarities between dialectic and rhetoric, Aristotle criticizes (sections 3 – 11) the Arts, or handbooks, of previous writers, which he finds unsatisfactory in several ways. Luke opens his Gospel with a fine periodic sentence, immediately reassuring to an educated speaker of Greek. His addressee is the unknown Theophilus, apparently a person of some influence (kratiste, 1:2) and bearing a Hellenized name. What Luke promises to provide is a version of the gospel which differs from the many others (pollo, 1:1) in existence by its orderly narrative (kathexes, 1:3) and its exactness of detail (akribos, 1:3; asphaleian, 1:4). He is writing for those already converted who want to know more. The words “that you may know the truth” (1:5) are somewhat misleading in the Revised Standard Version. Luke is not saying that the other gospels are not true, only that he will follow a more rigorous narrative method and be more specific. The similarities between the self-described purposes of Aristotle and of Luke should be apparent. Both writers are starting in with other writers on their respective topics. Both are straightening out the problems or are tightening up the loosenesses of other writers. Both are writing for and to people who are eager to learn more than the perhaps little they have only begun to learn. Now I want to tell you that Aristotle and Luke are doing something else. True, they are teaching and/ or preaching, correcting and propagating ideas respectively. Nonetheless, they are practicing rhetoric. In Aristotle’s case, he is practicing what he’s teaching. In Luke’s case, he’s practicing what he’s learned of Aristotelian rhetoric. In general, the rhetorical practice of a good opener of a rhetorical text of prose involves the “canon” or standard of rhetoric called “arrangement.” Well, you know that “arrangement” is English. The Latin technical term dispoitio comes well before the English word arrangement as its technical translation; and the Greek rhetorical-technical term that arrives before that Latin is one that Luke uses. Let’s look at this set, and then we’ll come back to Aristotle’s and Luke’s respective rhetorical and technical terms in their openers. Although Burton has referred explicitly to the Roman rhetorician Cicero, he has synthesized for us the corresponding Latin, English, and Greek terms. And Aristotle is really Burton’s frame for us here, as Aristotle was for Cicero. 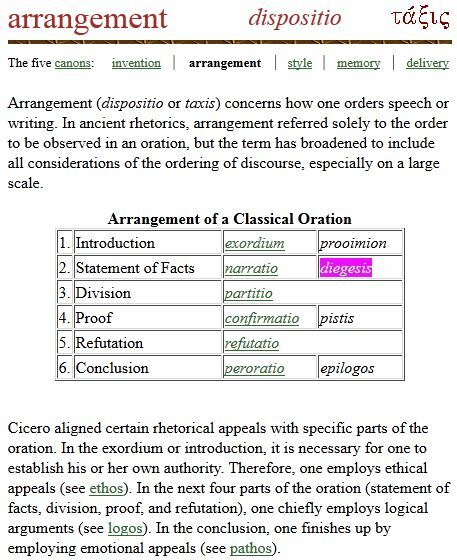 Though Cicero developed Roman rhetoric, he always credited Aristotle for the start to or foundation of all the divisions and genres and canons of rhetoric. Luke’s is the only use of either of these two technical rhetorical terms in the whole entire New Testament. And Aristotle’s use of his terms here is highly instructive and very technical. Both writers are arranging their material, introducing their topics, stating their facts. All too many students of Aristotle are, in their hearts, Platonists. I am not only content, but delighted, when Professor [Thomas] Farrell proclaims that I am [as Aristotle is] not a Platonist…. My suggestion to the philosophers … is that instead of reading the Rhetoric as a work of philosophy they should try reading Aristotle’s major treatises on other subjects as rhetorical constructs. Luke takes note, and so learns. It’s not just the what of the gospel, but for this writer, it’s also the rhetorical how. Verses 1 – 4 are only the beginning, only just the start. Thanks, this was fascinating! (And thanks for the shout-out, too!) The more I learn about how the world of the evangelists influenced their thought, the more I find there is to learn about it. Aristotle’s rhetoric! One can only wonder what Luther would have thought about finding Aristotelian method in the very words of the gospel. What would you recommend as a good intro to rhetorical criticism? One can only wonder what Luther would have thought about finding Aristotelian method in the very words of the gospel. I will go further with my boasting. I can expound psalms and prophets; they cannot. I can translate; they cannot. I can read the Holy Scriptures; they cannot. I can pray; they cannot. And to come down to their level, I can use their own dialectics and philosophy; and besides I know for sure that none of them understands their Aristotle. If there is a single one among them all who correcly understands one proemium or chapter in Aristotle, I’ll eat my hat. Of course, Luke follows Aristotle, modeling his “proemium” after the one in the Rhetoric. And Paul, whom Luther claims writes “gospel” by writing “epistle,” uses Aristotle’s word, “logike,” when writing in Greek to those in Rome. Luke makes sure that, in Acts, Paul is shown in Athens to be conversing in Greek, rhetorically, with real Greek rhetoricians. Some of Paul’s conclusions about male baldness and about female places in the household and in the assembly (i.e., the church) sound an awful lot like Aristotle’s conclusions on the same. And on and on it goes with the New Testament. The best is Sonja K. Foss’s Rhetorical Criticism: Exploration & Practice (and I like the 3rd ed better than the the 4th, because that earlier 2004 edition had a wonderful chapter on “Feminist [Rhetorical] Criticism”, which the later 2009 edition removes if partly subsuming under the chapter on “Ideological Criticism.”) An older intro to rhetorical criticism (1993) that is also wonderful is Landmark Essays on Rhetorical Criticism, compiled and edited by Thomas W. Benson. The individual essays, some newer and some older, are written from different perspectives by some of the best in the disciple; they offer respective rhetorical critiques of the rhetorics of Hitler, Lincoln, Darwin, Elizabeth Cady Stanton, George Washington, and so forth.